Lea, It is fun to come here and read what you are up to. I can relate to so many of your answers myself. When I was pregnant with #2 I ate a Hershey's Chocolate Almond BAR every day. I can't believe I did that. But they are so good. I love soups too. Have a wonderful time in Virginia - it's one of my favorite states. Enjoy your week, Lea! I was so surprised to read that you indulge in the little pieces of chocolate knowing you aren't crazy about it. But I would have a hard time limiting myself to only one or two a day. Yes to soups. They just seem so appropriate for this time of year. And, I wasn't surprised to see your word for the year. 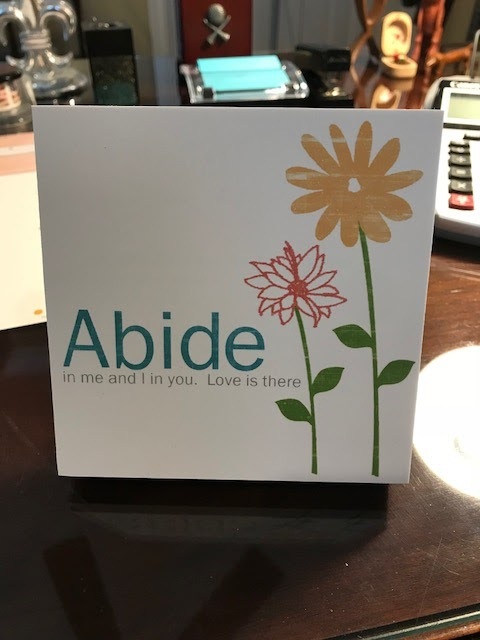 Although I don't usually do that, ABIDE would be a word for me also for some of the same reasons. Enjoyed my early morning visit with you and have a good day. I have a chocolate each day too and those little nuggets are the BEST! I love your outlook on life! Happy Monday beautiful! I love the Hershey Kisses with Almonds, but I usually can't just have one! Happy Monday! Great answers! You do have pretty hair, and I love me some Hershey's nuggets with almonds! "Abide" That's a very good word and we would all do well to make that our word of the year. Yes to soups AND those Hershey Nuggets with almonds! I usually like my hair cut better after a week or two...same with the highlights...it seems to look more natural. It was fun reading your answers! Have a blessed week! I love the idea of exploring new places where you live. I definitely need to do more of that. I totally agree on the soups - best comfort food there is! So glad you linked up with TBB today! Enjoyed this so much Lea. No Resolutions. I have a word to focus on for 2018 which is Hope. My goal is be more attentive to listening and slower to speak my opinion. YEP, this will be a challenge on that last part for me!!! Living in Florida there is no worry of snow or excitement of snow. I love to look at the snow, and would enjoy it as a visit but not to live in it. I so agree with you Lea on your answer. We surely do miss what's in our own backyard. I hear people say all the time that live near me that they have been lived here for years and yet never been to the nearest beach which there are several no more than an a hour away. There are several places within an hour or two that I also want to visit. Just getting back from Charleston it will probably be a few months before I go anywhere. But, I am thinking about a trip for me and my man. Neither. I love my hair cut and color to be honest. In winter months I tend to go with only low-lights and then I will kick in with my highlights before Spring. You know what Lea? I haven't thought about this until now! I think I would really like to have a day that I could get a massage, a facial, nails and toes done and then go buy myself a new outfit. LOL! That is sounding really good. Well, I guess I would say the weather as we never know what is what. We have had freezing temps, no power and etc. and then today we have rain and it's going to be 70 degrees. I just Praise the Lord that I have made it to a brand new year. Depends on when I got it all up!.LOL! This year I took down kitchen, dining room and bathrooms a few days after Christmas and then on Jan. 2 I took down my living room decor and tree. No. I try to eat healthy or lets say be conscious about NOT overeating and being a glutton. I've always felt that If I called it a diet then those first three letters say DIE and that I would do. LOL! For me personally, it's all about choosing healthier options and change of lifestyle. If I really want something....YEP, I am going to eat it. Nothing in my home right now but oh Lord have mercy do I need to get to that She-shed and do some major work. When the weather works me I plan too. Soup and chili and oh yes, I will take a piece of cornbread to go with it. Chocolate peanut butter balls. OH MY! My daughter makes them every Christmas and that is one thing I have to repeat to myself...ONE Cindy....ONE...NOT FIVE!